The gravestone of Johannes Walk (b & d 1769) will be returned to his home church of Friedberg Moravian Church near Winston-Salem, North Carolina during the homecoming worship service on October 19, 2014. The public is invited. Johannes Walk lived only for a few months, but we remember him – he is related to nearly half of our members. Johannes was the infant son of Martin Walk Jr. and Elisabeth Fiscus Walk. Baby Walk’s grandmother was Catherine Clore, daughter of Germanna colonist Michael Clore of Gemmingen, Baden-Wurttemberg, Germany who arrived in Virginia in 1717/18. The stone was stolen many years ago from Friedberg’s cemetery, and was turned over to the Germanna Foundation by the County of Culpeper after it was discovered in December 2013. (The Dispatch) The homecoming celebration Sunday at Friedberg Moravian Church in northern Davidson County will be more than just an annual celebration. It will be a true-to-life homecoming for the tombstone of a 6-month-old infant who was buried at the church in 1769. The infant’s tombstone was recently discovered in Virginia. Jimmy Snyder, historian for Friedberg Moravian Church in northwestern Davidson County, said someone with the Germanna Foundation contacted the church after a cleaning crew in Culpeper, Va., found the tombstone of Johanes Walk, born March 4 and deceased Nov. 13, 1769, propped up against a tree in an abandoned field last December. Members of the local homeowners association in Culpeper notified the director of the Museum of Culpeper History after finding the tombstone, who turned to the Germanna Foundation for help. The Germanna Foundation, whose mission is to preserve the early German-American heritage in colonial Virginia, researched the marker and discovered Johanes was the infant son of Martin Walk Jr. and Elisabeth Fiscus Walk, whose colonist ancestors arrived in Virginia from Germany in 1717. Steve Hein, chief operating officer for the Germanna Foundation in Virginia, said the tombstone mystery is unusual for the organization, but thanks to its extensive genealogy records, tracing Johanes’ family history was fairly straight-forward. In March, the mystery of the tombstone became a little clearer when former Culpeper resident James Lee Lloyd shed some light on how the tombstone came to be left in the field. According to Lloyd, he had purchased the stone 30 years ago from an antiques store in Fredericksburg, Va. He said he had abandoned the stone when he decided to move to Arizona and didn’t want to take it with him. Snyder was contacted by officials with the Germanna Foundation as well as the historical museum in Old Salem about the tombstone. He said the church had previously replaced Johanes’ tombstone in the 1950s, so it was pretty clear it belonged to the church. Members of the Germanna Foundation will present the tombstone Sunday, and the 7-year-old five times great-grandnephew of Johanes Walk will attend the service. Johanes has a very prominent historical connection to the church, Snyder said. Records shows that he was one of two babies who were baptized the day the church building was consecrated in 1769. His was one of three graves the congregation stood around during its very first Easter Service in 1770. The original tombstone will be placed in the church’s museum of historical artifacts. Research your Germanna roots! Become a member of the Germanna Foundation to get access to Germanna’s exclusive genealogy database with thousands of names. 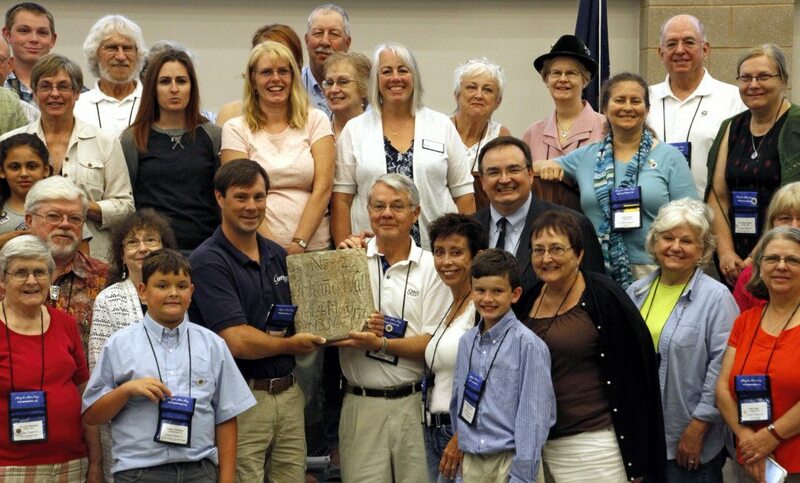 The Germanna Foundation tells America’s story of liberty through the frontier experience of her settlers and descendants using archaeological, historical, and genealogical research and interpretation. Become a member of the Germanna Foundation and get access to Germanna’s exclusive genealogy database, GermannaFamily.org, with thousands of names. Research your Germanna roots! Out of town visitors are urged to call us at 540-423-1700 to confirm or to make special arrangements for groups. Behind the Fort Germanna Visitor Center is our 170-acre Siegen Forest nature and hiking trails along the Rapidan river. Remember the Germanna Foundation in your Will and Estate Plans. The Germanna Foundation is a 501(c)3 nonprofit organization dedicated to exploring the Colonial Virginia frontier via the historic 1714 Fort Germanna and its German colonists and their descendants. It conducts archaeological exploration and conservation, genealogical research and publishing, and historic preservation and interpretation. The Foundation owns and maintains several historic sites and properties, such as Salubria Manor, that were part of or closely connected to the Germanna colonies, the town of Germanna, and the other early colonial Virginia settlements and towns in the Piedmont area of Virginia.